Pediatric dentist Dr. Anu was inspired to become a dentist as she always believed that good oral health leads to good overall health. She enjoys caring for all of her young patients; she finds it particularly fulfilling to take care of children with special needs. Dr. Anupama was born and raised in India where she completed her Bachelor of Dental Surgery Degree. 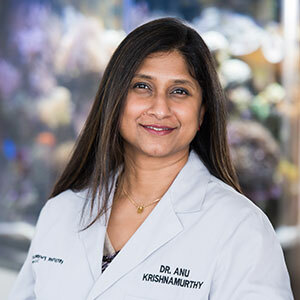 After moving to the United States, Dr. Anu earned her D.D.S. in 2007 from the University of California, San Francisco. She also obtained a certificate in Advanced Education in General Dentistry (AEGD) from University of the Pacific. She did her Pediatric Residency Program at NYU Langone Medical Center in Tampa, Florida. Additionally, she is a Diplomate of the American Board of Pediatric Dentistry. To stay abreast of the latest in pediatric dentistry, Dr. Anu takes continuing education courses annually. When she’s not at Children’s Dentistry Group, LLC, Dr. Anu enjoys spending time with her son Ari as well as other family members. Dr. Anu also likes to read, travel and learn about different cultures. She is multilingual and can speak five languages. Contact us today to schedule an appointment with Dr. Anu!